Historical financial market data shows U. S. stocks have traditionally been the best performing asset class over most 10-year periods in the past century. DeCamilla Capital's approach to asset allocation recognizes such a successful long-term track record and that U. S. stocks should, and do, warrant the weight of a portfolio’s asset allocation. We prefer to remain 100 percent invested in market listed equities—and like-minded clients hire us with this attitude in mind. While the U. S. stock market is far from perfect, DeCamilla Capital knows the facts and odds favor owning the best long-term performing asset class, domestic equities. No one can divine the perfect time to be in or out of the market so we are firm advocates of a proactive fully invested approach to asset allocation. Riding out a bear market is not nearly as painful as missing the upside of good markets. A fully-invested approach may be weakened or enhanced due to specific client factors and circumstances. Other than emergency or special purpose savings DeCamilla Capital views cash as a temporary holding and we encourage our clients to reflect this perspective. This is not to say we can’t, or won’t raise cash during periods of over valuation or economic stress. Cash is simply not a permanent component of the DeCamilla Capital allocation—it is a temporary condition and staging area prior to our making longer term commitments. Because of our long-term focus clients should not expect us to meet their temporary or unforeseen liquidity events without us having to sell assets at what could be inopportune times. The belief one can somehow avoid market volatility by spreading capital over a wide and usually obscure array of assets is the myth of asset allocation. Often what passes for “asset allocation” and “rebalancing” are a fool’s errand and an excuse to sell something to somebody. At DeCamilla Capital we think it is impossible to consistently avoid market volatility through security diversification, sector rotation, or market timing. We recognize that the 24-hour news cycle and global economic interdependency can create periods of high financial anxiety where there is really no place to hide other than cash. We operate under the premise the world will only end once despite daily news headlines. 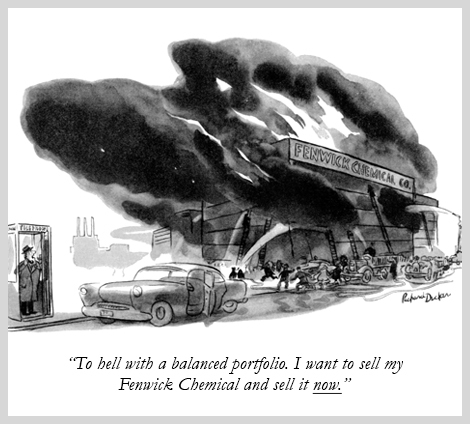 Building investment portfolios for Armageddon is pure folly and against long-term probabilities.